It’s no secret that Adam Thielen is on a historic streak, having racked up at least 100 receiving yards in six straight games to open the season. But the Vikings wide receiver is also on a three-game touchdown streak, as well, as Thielen has found the end zone once in the past three games against the Rams, Eagles and Cardinals. Danny Kelly of The Ringer recently wrote that Thielen’s Week 6 third-quarter score, a 13-yard touchdown pass from Vikings quarterback Kirk Cousins, was one of the biggest game-changing plays from the weekend. We can’t end this column without mentioning Vikings receiver Adam Thielen, who notched his sixth straight game of 100-plus yards — just the second player in NFL history to do that in his team’s first six games. The 28-year-old pass catcher has 58 receptions on the year, the most ever through six weeks, and is on pace for 155 catches, 1,899 receiving yards and 11 touchdowns. Not shabby for a guy who played D-II and didn’t get a combine invite. It seems like we’re already running out of ways to describe just how good Thielen’s been this season, but the Vikings aren’t running out of ways to deploy their go-to pass catcher. In Sunday’s 27-17 win over the Cardinals, this play from early in the third quarter stood out: Thielen lined up with a very tight split — inside tight end Kyle Rudolph — a tweak that got him matched up in coverage against Arizona linebacker Josh Bynes. You can probably guess how that went. That touchdown capped a 10-play, 75-yard drive, put the Vikings up 20-10, and pushed their win probability to 87 percent. Minnesota never looked back. The Vikings have been up and down in almost every respect over the first six weeks, with wild performance swings from just about every unit, whether that’s the pass rush, the secondary or the run game. But Thielen’s been a constant for Minnesota: a dependable playmaker who’s posted elite production every single week regardless of opponent or weather. And there’s no sign that he’s slowing down. Thielen leads the league with 58 catches for 712 yards and also has four touchdowns, which is one off his career-high set in 2016. The Minnesota native was a Second-Team All-Pro and first-time Pro Bowler in 2017. The Vikings are above .500 since getting a Week 1 win over the 49ers. Minnesota followed with a tie and a loss before picking up two straight wins over Philadelphia and Arizona. Dan Graziano of ESPN recently wrote that the Vikings are one of a handful of teams who have overcome sluggish starts to get back on track as the season nears the midway point. The Vikings will look for their third straight win on Sunday as they play the Jets in New York. 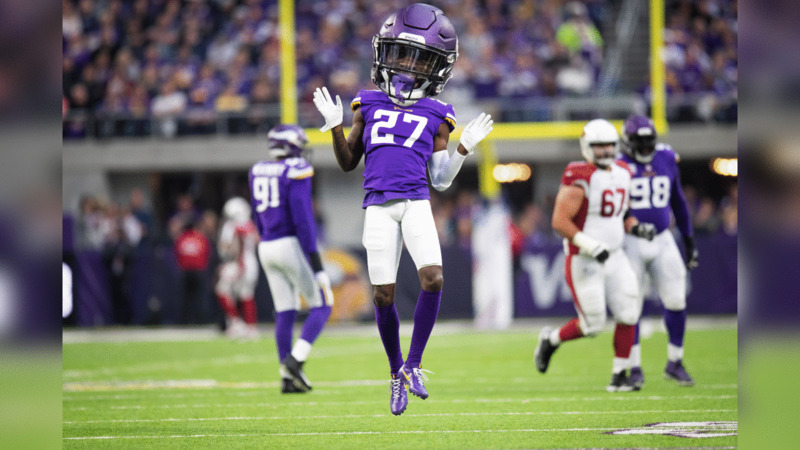 View the Vikings in "Big Head Mode" as the team defeated the Arizona Cardinals at U.S. Bank Stadium on Sunday.